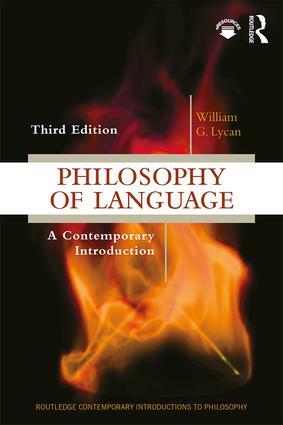 Now in itsthird edition, Philosophy of Language: A Contemporary Introduction introduces students to the main issues and theories in twenty-first-century philosophy of language, focusing specifically on linguistic phenomena. Author William G. Lycan structures the book into four general parts. Part I, Reference and Referring, includes topics such as Russell's Theory of Descriptions (and its objections), Donnellan's distinction, problems of anaphora, the Description Theory of proper names, Searle's Cluster Theory, and the Causal-Historical Theory. Part II, Theories of Meaning, surveys the competing theories of linguistic meaning and compares their various advantages and liabilities. Part III, Pragmatics and Speech Acts, introduces the basic concepts of linguistic pragmatics and includes a detailed discussion of the problem of indirect force. Part IV, The Expressive and the Figurative, examines various forms of expressive language and what "metaphorical meaning" is and how most listeners readily grasp it. up-to-date coverage of new literature, further reading lists, and the bibliography, as well as an improved glossary. "An authoritative, pedagogically sensitive and superbly clear introduction to the central issues of the philosophy of language." William G. Lycan is William Rand Kenan, Jr. Professor of Philosophy Emeritus at the University of North Carolina, Chapel Hill and currently Distinguished Visiting Professor at the University of Connecticut, Storrs. His eight books include Consciousness and Experience (1996), Real Conditionals (2001), and Philosophy of Language: A Contemporary Introduction (Third Edition, 2018). An innovative, well structured series, the Routledge Contemporary Introductions to Philosophy are designed for students who already have completed an introductory-level course in philosophy. Each book introduces a core general subject in contemporary philosophy and offers students an accessible but substantial transition from introductory to higher-level college work in that subject. The series is accessible to non-specialists and each book clearly motivates and expounds the problems and positions introduced. An orientating chapter briefly introduces its topic and reminds readers of any crucial material they need to have retained from a typical introductory course. Considerable attention is given to explaining central philosophical problems of a subject and the main competing solutions and arguments for those solutions. The primary aim is to educate students in the main problems, positions and arguments of contemporary philosophy rather than to convince students of a single position.